If you light up every time you see your groom, there’s no better way to celebrate the special bond you share than with a ring that gleams as bright as your smile. Our men’s titanium wedding ring with black resin and four cubic zirconia is an eye-catching solution that will add a little sparkle to his daily ensemble. Alternative metals are quickly growing in popularity, and titanium is leading the way. Titanium is a popular alternative to platinum, palladium, and white gold. Each 7mm men’s titanium wedding ring with black resin and four cubic zirconia features a satin-finished band that accentuates the brilliance of the cubic zirconia stones. Between each channel-set cubic zirconia, you will find resin details that provide a two-toned look to complement a wide variety of accessories. The men’s titanium wedding ring with black resin and four cubic zirconia is a sophisticated solution for the modern man. 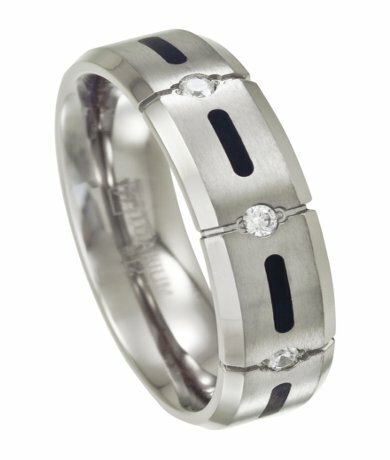 The satin finish is complemented with polished beveled edges, which give this wedding band an architectural edge. We designed this ring with a comfort-fit band by using extra titanium to create a slight dome for large knuckles. Comfort-fit wedding rings tend to measure a half size smaller than traditional rings. We recommend that your groom visit a local jeweler to have his finger measured for a comfort-fit ring. If you have any questions about the 7mm men’s titanium wedding ring with black resin and four cubic zirconia, please feel free to contact JustMensRings.com today. Thank you for choosing us as your one-stop shop for the most important jewelry he’ll ever wear. Nice ring, I bought this ring for my husband for his birthday. He likes it a lot and so do I. Good looking ring. This ring is everything I could have ever hoped for. It is absolutely stunning, and my fiance loves it so much, he cannot wait to wear it once we are married. I was pleased that the ring was shipped very quickly. I had a very pleasant shopping experience here, and would recommend this website to anyone looking to find gorgeous men's rings such as this one. This ring is stunning. The black resin and Czs really make it standout. The stones were very well set and the comfort fit is really easy on the fingers... I love this ring so much I want to wear it myself. My fiance also loves it - he wears it all the time cause it's so comfy! You won't regret this purchase. The ring was gorgeous, better than I expected. My husband loves it as his wedding band. It was reasonable and looked even better than the picture. Would definitely order from here again . Bought this ring for my husband after he lost his white gold wedding band over the side of our boat! He loves it and wears it more than he did the white gold band! Delivery was perfect. Fit was great as well! Thanks so much for the excellent service! Hopefully I won't have to buy anymore wedding bands for him but if I do I will be buying from here again!